A recent study by the Aquaculture Stewardship Council (ASC) into recognition of and positive associations with its consumer logo has shown that the organisation is on track with its programme to encourage the public to eat more certified responsibly farmed seafood. ASC is a leading certification and labelling program for responsibly farmed seafood, that promotes the best environmental and social performance in aquaculture. Its distinctive logo on fresh fish counters and on packs of ASC certified farmed seafood, helps consumers to make informed purchasing decisions, based on reassurance about ethical and responsible methods of production. Research was carried out in the Netherlands, Germany and Switzerland, where retailers have embraced the logo for responsibly farmed seafood, and where a total of 1,174 ASC certified products are on sale. Dutch retailers currently offer 425 products, German retailers 415 products, and Swiss retailers 334 products. Globally, there are currently 3,231 ASC certified products available. 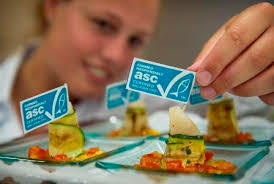 In both the Netherlands and Germany, the level of recognition by fish buying consumers of the ASC logo showed steady growth in 2015, exceeding that of the previous year’s study. The research was carried out for the first time in Switzerland, where almost a third of the sample recognised the logo. Respondents were also asked if they had positive associations with the ASC logo, and in all three countries, the answer was highly encouraging. In the Netherlands, 43.6% of fish buyers replied positively, with German consumers just behind at 39.3%. In Switzerland almost half (47.1%) of the sample who recognised the logo had a positive association with it. “As a young organisation, we are very pleased with these results, as our logo has been on packs for less than three years,” said ASC CEO Chris Ninnes. “We are working hard to play our part in helping transform the world’s seafood markets. Aquaculture already accounts for more than half of all seafood consumed around the globe, and it will increasingly become more important over the next few decades. Our mission is to ensure that it is produced in a responsible manner, and to help consumers purchase seafood that fits this criteria,” he said.